We have entered the trenches of the vaccine wars. 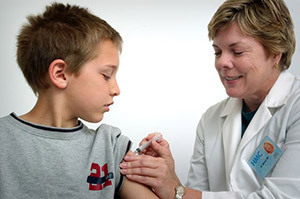 Last fall, the startlingly low immunization rates in our not-so-tinseled town were made public. Many people learned that schools in the most affluent Los Angeles communities had extremely low immunization rates, matching those of South Sudan, and it more than raised some eyebrows. The pro-vaxx/anti-vaxx battles heated up. The map of greater Los Angeles displayed dots of shame on schools with low immunization rates. But that was then. These dots are no long just symbols on a map — they are now actual dots on children. Deadly dots. We’re not just looking up stats anymore. Measles has landed, and a pox is upon us. Dr. Nina Shapiro is the director of pediatric otolaryngology (ear, nose and throat conditions) at the David Geffen School of Medicine at UCLA. This column appeared Feb. 19 in The Hollywood Reporter. Living in this city as a parent of school-aged children and as a doctor, I have seen many responses to this very real outbreak. At my work, we were told to check our measles titers, (indicating "immunity" or "protection" from measles), or to get MMR booster shots. Immediately. Schools, play groups and daycare centers have been sending out frantic mass emails, warning parents of signs of measles and instructing what to do if their child is infected (hide). Some private facilities have banned unimmunized children from attending. Many doctors' offices have done the same. Last week, a friend’s daughter had a fever, red eyes and a full-body rash. She was fully immunized, but her doctor had her come to the office, through the back door, after hours, in the dark, to make sure it wasn’t measles. It wasn’t — but it could have been. A 7-month-old patient of mine had a fever and itchy eyes. He is too young to be immunized. This time last year, we would have written it off as one of the thousands of cold viruses that go around in the winter months. This year? Quarantine at home. It might be measles. It wasn’t — but it could have been. People may make jokes, write clever tweets — and even poke fun at the new ridiculous concept: measles parties — but they’re scared. Since most of us have never seen a case of measles (or mumps, or rubella, or pertussis, or polio, to name a few), we are terrified that these microscopic monsters will wreak havoc on our neighborhoods. Our schools. Our houses. My waiting room. And while "measles party" hosts still think that measles is "no big deal," we’re also afraid of what’s around the corner. “If it’s polio we’re talking about, things will need to get serious,” I’ve heard. Seems pretty serious to me already. Look at any photo of kids in line for a polio vaccine in the 1950s. You see stoic faces, silently waiting. The shot recipient has not so much as a grimace, as the photographer catches the image of the needle piercing the skin. Now look at any photo of a child receiving a vaccine in the last 10 years or so. There was no waiting in line, at least not in this country. Especially not in well-heeled precincts of L.A. Vaccine photos of today invariably show a wailing child and a cringing mother, holding her baby in a near chokehold. Such a dichotomy reflects an historic shift in our feelings about vaccinations as a society. It's not the viruses we fear; it's the shots that protect us from them. The pro-vaxx/anti-vaxx movements have created such polarization that we have begun to fight against each other, rather than the microscopic killers we call measles and pertussis. Factions have developed, both publicly and privately. Those who have questioned safety and efficacy of vaccines are now being shunned, mocked, even threatened. I have had patients withhold the fact that their child has not been immunized, for fear of being ostracized by me, their treating physician. The social media frenzy is certainly spreading the word, spinning clever hashtags, and making for some great entertainment. But is it killing the measles virus? Probably not. It is, however, separating us humans, making for some unpleasant schoolyard encounters between parents. Will the pro-vaxx pressure change people's minds? Probably not. And while the California loophole of PBE (personal belief exemption) might be cinched tight, my guess is that those who stand by their choice will find other means of avoiding vaccines. Living in a bubble of privilege, few realize how lucky they are to even have a choice about immunizing or not immunizing their child. The seemingly intellectual pseudoscience that I hear regularly is frightening. I listen to highly educated, caring, thoughtful families who think that not immunizing, or delaying immunizations, has made their children healthier and stronger. That this has even made their immune systems more robust. These are folks who don’t know a T-cell from a B-cell, an antibody from an antigen. But they are remarkably comfortable assessing a robust immune system. Because I wear several hats — doctor, mom, school parent — I’ve bitten my tongue so much over the past few months that it’s gotten permanent tooth marks. Unfortunately, I can chalk up some misleading or flat-out wrong information to a few downright dangerous physicians who are steering their patients wrong. While they may erroneously emphasize risks and lack of necessity of vaccines, they fail to mention risks of not getting vaccinated. Because these doctors are well-spoken, sell books and have lovely offices and fancy clientele (yes, I’ve heard people refer to patients as "clients"), educated parents buy their stories. In reality, the overwhelming majority of children are healthy, require very little medical care, and heal and recover from most illnesses quite quickly. So when I hear, “My child has never been sick, and I go to Dr. X,” do they really think that the fact that Dr. X hasn’t immunized their child is why their child hasn’t been sick? It must be that robust, unimmunized immune system of theirs. My 7-year-old son wanted to do a project to raise money to send to developing countries. The funds would help pay for polio vaccines. As a first-grader, he thought it was really cool that a shot cost a dollar, that they dye kids’ fingertips purple to keep a record of who has been immunized, and that he could save some lives across the world. How do I explain to him that, noble as his intentions are, this is a hot-button controversial issue that may offend up to 20 percent of his own school community? How do I tell him that while he wants to help grow a robust herd immunity against horrible diseases abroad, his own herd’s immunity at home is crumbling? I tried several ways to explain this grave and sad situation. No matter how I tried, he still didn’t get it. Nor should he.